Features mood-lighting to set the ambiance and a Bluetooth speaker to play music! SMALT is not just an amazing addition to your smart home, it's also a fun way to shake up the night! 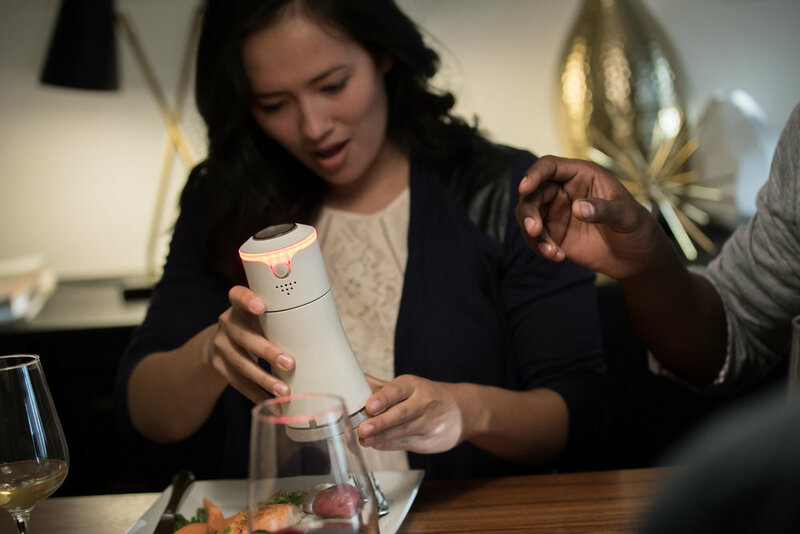 More than just a centerpiece and more than just a smart salt dispenser, SMALT is a conversation starter and a great way to entertain guests. Enhance your dining ambiance with color-changing mood light. Make any moment more memorable. SMALT dispenses salt with a shake/pinch of your smartphone screen or simply turning the dial manually. Whether you want to add a pinch or a teaspoon full, simply turn the dial and hit dispense. Shake, pinch or pour, all using your smart phone. Salting is so much fun with SMALT app. Connect SMALT with Amazon Echo and simply say “Alexa, dispense half a teaspoon of salt". Sign-up to be the first to know when we launch SMALT! We will notify you when SMALT is ready for the world. You have been enrolled to win a FREE SMALT at the launch.